We were saddened to hear of the passing of Dr. Kimberly Molto, a friend and colleague in the study of the unknown, this past Saturday May 14th, 2011. Kim was a good friend to many of us here on the PSICAN team and a highly respected author and student of the paranormal throughout the field. Outside of the books and paranormal research, Kim had a Ph.D in Cognitive Neurobiology (consciousness, thought processes with a sub specialty in depressive/suicidal states) and one could argue a great survivor who weathered many personal tragedies. Her outlook on the paranormal in terms of survival of bodily death was literate and well thought out. She presented her ideas and information with dignity, intelligence, and enthusiasm through her books and her hands on field studies. Those of us who had the pleasure of communicating, working with, and generally getting to know her as a person are far better for the experience. "When the end comes, you are faced with fundamental questions: What have you done with your time on Earth and is the world a better place for your having been here?" ~ Andreas Panandreou who died and was revived, from an interview she did for her first book. We hope Kim knew she could answer, "Yes." to that second part... because if your contributions towards the good of this planet are based on those who you've touched, who care about you, and who admire you, and I think it's safe to say yes to that, then Kim did extremely well. We were honoured and privileged to have known her... and we will miss her. The paranormal community has suffered a huge loss that cannot be replaced, but we can move forward as Kim would have wanted us to, and continue to learn, and build upon her good works. To learn more about Kim, her personal experiences with the paranormal, and her research please click on this interview. Dr Kimberly Molto had been a great supporter of the Canadian Mental Health Association - Guelph branch. For those who would like to honour her memory with a monetary tribute you can obtain information on donating to CMHA - Ontario by clicking on the link provided. 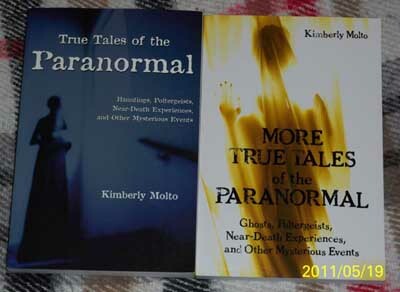 Dr Molto's books True Tales of the Paranormal, and More True Tales of the Paranormal are available for purchase through most major retailers such as Chapters, and Amazon as well as available through the public library system here in Canada. "They are in a better place, but we are left behind ..."
Kimberly I. A. Molto, PhD.